​I guess you could say I doing a tourist plug for New York State, but not really. I have lived my entire life in rural, Western New York: Smack between Buffalo and Rochester; about an hour from Niagara Falls; a stone's throw from Letchworth State Park; Watkins Glen; and either of the lakes, Ontario or Erie. All beautiful places to visit. I live in small town farm country: Green pastures; golden fields of wheat and fields of swaying corn...Some say they can listen to the corn grow on quiet evenings. And let's not forget the cows. I jokingly say the cows outnumber the people in my neck of the woods. Farm country is an entity onto its own. Spring, Summer, and Fall, are seasons of planting, tending and harvesting. Norman Rockwell would have been in his glory in small town New York. New York State has it all. We can hop in the car and drive thirty minutes to view rolling hills of incredible beauty, or set course across state to the majestic Adirondack mountains, and Thousand Islands. We can head north a ways and walk the beaches of Lake Ontario, or wander among the apple orchards. Late winter is maple syrup time, and Autumn in New York State is an incredible masterpiece of color: vibrant reds, yellows, and oranges burst on the scene, taking our breath away. God truly does good work. Over the years I have dreamed of living in other states, warmer states. South Carolina, North Carolina, Virginia; all gorgeous; all warmer. The strange thing is, however, that no matter how beautiful these other states are, no matter how much warmer they can be, when we end our vacations and cross over into New York I feel we are coming home. And when we actually drive into our small town...I am home. I love our state. Always have, always will. Something has drastically changed in the past month, however, that has tarnished the beauty of our state. On January 24, 2019 our state's governing officials passed the bill, making it legal for a woman to have an abortion up to and including the time of the baby's birth...and after. The law was passed amid jubilant cheers and shouts. Our Governor very proudly and defiantly announced that New York City is the capital of abortion. He also announced that our state has no room for "radically conservative Christians" who support life. As far as he's concerned we can all just pack our bags and leave. So why am I writing this article about my state? After this law was passed, I was reading comments from people around the country to do with this decision, and I was brought to tears. New York State was deemed by some as evil, a place they would never step foot in. We were all doomed to hell. My tears quickly turned to straight-out anger. Anger at our representatives, who in no way spoke for the majority of the people of our state, but as a result of their actions tarnished us as a whole. These new laws have taken abortion over line into infanticide. Tiny, helpless babies can now be slain right up to the time they are born, and beyond. And what happens to these babies? Are they given a burial by the families? Some may, but most don't. Many are sold for body parts, and experimentation, (It's all about money) or others are disposed of as toxic waste. All suffered horribly before their deaths. New York State, and New York City, even though considered to be one entity, aren't. New York City may be the capital of abortion, but so many of us in the state of New York State support life. Our Governor and other representatives, who tend to forget Up-State and Western New York exist, did not speak for us. If they had the result would likely have been entirely different. No matter your stand on abortion, these new laws are nothing to be cheered about. Our culture as a whole is changing rapidly, faster than I could ever imagine. These new laws are just one example. But, the message I need to put out there is these new laws do not speak for us as a whole. This is a beautiful state, filled with wonderful people. People of all beliefs. For the most part we respect one another. So, to answer those people who said they would never step foot in this evil state; that's your choice. But, know this; New York State is a wonderful place to live. It's my home. ​A couple years ago, around Halloween, my grandson, Mason, turned me onto Halloween Wars. So this past Halloween I checked it out again, and I was hooked. While I'm not a huge Halloween fan, I was amazed at the spooktacular creations made by carved pumpkins, pulled sugar, and massive cakes. Well, my fascination took me from Halloween into Thanksgiving and on to Christmas. 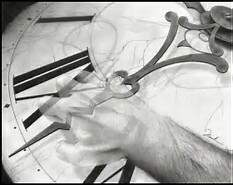 The creative processes involved in constructing these masterpieces was beyond my comprehension. These were not merely bakers, they were artists. I found myself listening to the exhibitors stories, learning about their families and what drove them to put everything on the line for a chance to participate in these daunting events, and hopefully win. I had my favorites and I would cheer them on from my living room...ecstatic if they won, saddened if they were sent home. ​A little over a week ago, while wrapping Christmas presents, I watched a new show, at least to me, about a massive Gingerbread contest. Now, when I say gingerbread what pops into your mind? Cute houses glued together with icing and decked with all sorts of candy? There were no cute little houses to be seen. These masterpieces took the artists months and months to create. They were massive, spectacular, gorgeous, completely edible, works of art and in some cases engineering. I watched with bated breath as these artisans carefully packed and delivered their gingerbread marvels to the hotel where the exhibit was held, and ever so carefully placed them on the tables. Only then did the exhibitors take a breath. And yes, I had my favorites. I also had one particular woman who I hoped with all my heart would not win. Ouch! Sounds harsh? Well let me explain. The woman then noticed a couple of the man's figures on his piece and asked how he made them. He answered that he used some kind of ginger paste. To which the woman announced, "You know who first created that paste don't you? I did!" This woman had a serious attitude. She was grand champion and she made sure he knew it. Well, the time finally came for the winner to be announced, and let me tell you, the judges had some serious work to do. These pieces were phenomenal. The host called the top ten forward, and no surprise, Ms. Grand Champion, was one of them, smug smile plastered across her face. That smile quickly disappeared when the winner's name was called. Horrors! It wasn't her. The young woman, one of my favorites, had created a whimsical woodland scene upon a circular pedestal. When the judges bent to see beneath they saw the intricate root system of the tree hanging down. This young woman when hearing her name jumped up and down and whooped with glee. The camera man quickly panned from the ecstatic winner to the three time grand champ. To say she wasn't happy would be a gross understatement. ​After watching this show, I watched a couple other baking and cooking competitions, but I watched with new eyes. One show in particular had the winners from former contests. They were put into teams of two and given their assignments. I remembered two of the contestants from previous shows, and remembered when they won. I was sort of happy for them. This time, however, I was hoping they would lose. The man proceeded to announce that he had been in three prior contests and had never lost a single time...he wasn't planning on losing this time either. The woman had pretty much the same attitude. Let's just say they did not leave that contest happy. After watching a couple more shows, one was Chopped, I began to pay close attention to the contestants attitudes. Some, even though they were incredible cooks, were extremely humble. They were hoping to start a business, or help their families with the winnings; they wanted to make their families proud. Others knew they were good and didn't waste time announcing their talent to all. They had this contest in the bag. They would be going home winners, no question. Time after time I noticed the braggarts would mess up in someway and be sent home with jaws agape. The quiet, humble chefs did their jobs to perfection and ultimately won. Jesus said that the meek shall inherit the earth. He warned against pride...so much so that it is one of the seven deadly sins. Pride goes before the fall. The first will be last and the last first. I could go on and on. Jesus, although He was a King, became a servant; to the point of washing His apostles feet. He warned in a parable concerning guests at a wedding table, not to take the most important seat because the Host may have that seat reserved for someone of greater import, and you would be asked to move down. Rather, sit in a less obvious seat and perhaps the host will invite you to move forward. The arrogant contestants on these shows should have remembered this lesson. Instead, they were served a heaping helping of Humble Pie. I wouldn't have wanted to be them and have my family and friends watch the shows, hear my bragging, watch me be sent home. Being sent home would not be bad, having my prideful, arrogance splashed across the big screen for all to see, that would be bad...at least for me. So, it's November 1st and we set the clocks back in the wee hours Sunday morning, or if you're like us, whenever we go to bed Saturday night. I'm not liking this change at all. Getting dark an hour earlier...ugh! But on the positive side, December 21st is the shortest day of the year and then the days start getting longer, or at least the sun sets a little later each day. Yay! I have a confession to make. I have not been looking forward to Christmas one little bit. I mean, come on, we still had snow in May, and somehow jumped past Spring straight into the sweltering heat and humidity of Summer. I lived for air-conditioning. I don't know what the weather has been like in your neck of the woods, but here, we still had summer temps. of eighty degrees in October, that was really nice. One week eighty degrees, and then as if someone flipped a switch the temperature plummeted into the forties...completely bypassing the sixties and fifties. Gotta love western NY weather. So, back to my hum-bug attitude toward Christmas. As I'd scroll through Face-book, I'd stumble across some ultra cheery posts counting down the days till Christmas. While people were commenting their joy and excitement I declared: "Bah-hum-bug. Don't remind me of Christmas." Why my less than cheery attitude, you ask. One word. WORK! Okay, two words. WORK and SNOW! Bah! I imagined all the running around in messy weather trying to find the perfect gifts and spending way too much money. I imagined hauling our numerous bins of Christmas decorations down from the storeroom, and all the work involved in not just setting them up - that's fun - but taking them down a few weeks later - not fun. I imagined all the stress and hub-bub related to all that has become Christmas. Not me this year, thank you very much. Just let me sleep through it. But, then something changed. What? you ask. Our monthly praise night at church changed. We normally have the praise night on the 3rd Wednesday of each month. So, November would be music of thanks giving. But, my niece, and partner in all that is fun, had an idea. Let's do the praise night every two weeks, and let's do all Christmas! She named the event: Straight Outta Bethlehem. Cool! Amy sent me a list of Christmas songs, a list which continues to grow, and I began listening to the songs to plan the music. And something happened as I listened to song after song. My doldrums began to melt away. I found myself smiling as I sang (poorly) along with the videos. Sweet memories began to warm my heart. I began thinking about the first Noel when angels sang. 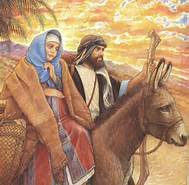 I began journeying with Mary and Joseph to a little town in Bethlehem where Baby Jesus was born away in a manger on a not so silent night. Thanks to my niece's simple idea to extend Christmas Praise Night into Nights, and the need to listen to music that I normally wait till after Thanksgiving to enjoy, I am rediscovering the joy of Christmas. Let me rephrase that. I am rediscovering the wonder of Christmas. So, what about the snow and work? Well, I can't do much about the snow, actually I can't do a single thing about the snow. That's still a bah! But, the work? I've decided to make one tiny change. Keep the decorating simple. Just because we have numerous bins of decorations in the storeroom, doesn't mean I have to put out every single piece. Maybe if I don't look in the bins I can do this. Phew! I already feel a weight lifting from my shoulders. I still don't want to be reminded how many days till Christmas. Time slips by all too quickly without reminders. But, I'm no longer dreading it. Thank you Amy. If you were suddenly given the opportunity to turn back time and undo one mistake, no matter how big, what would you do? Only one? I have so many. But if I could go back and get a do-over, I know the one I'd choose. Unfortunately time only moves backward once a year when we set the clocks back and that doesn't count. There are no do-overs. Now take a moment and think about Adam and Eve and the horrible mistake they made. They lived in perfection walking and talking with God. They were as intimate with the Father as any person could be, after all, God created them with His own hands and breathed His Life Breath into them. That's intimate. What more could they ask for, what more could they desire? Nothing, right? The tempter is sneaky, conniving, devious and oh-so enticing in his lies. Even though Adam and Eve were created by God and in His image, the wily serpent slithered up to Eve and convinced her that they wouldn't die if they ate the fruit from the Tree of Knowledge of Good and Evil, as God had told her, AND, as an added bonus, they would be just like God. (Which they already were.) I don't need to tell the what happened, we all know. Adam and Eve were forced to live out the rest of their long lives in a world now cursed. They felt the anguish first hand when Cain murdered Abel; one brother slaying the other. Their grief had to be immeasurable, especially knowing it all happened because of them. Adam and Eve, though they had sinned and had been banished from the garden, held strong to their faith in the One True God. We only have to take a look at their lineage to attest to this fact. And God's love for them never wavered, even though they sinned. He loved them before He created them, and he loves them still. We don't have the ability to turn back time and undo our mistakes, and that is good. We would likely do more damage than good. Which is why we need to be so very careful of the choices we make and the words we say. I am so very thankful that even though we can't undo our mistakes, we can be forgiven for them. All we have to do is turn to Jesus. It was in a garden that the first Adam said, "Not Your will but mine be done" ushering in sin and death. It was in a garden that the second Adam, Jesus Christ, said, "Not my will but Yours be done," smashing the head of the serpent under His heel. It was through His death on the cross and His Resurrection that Jesus, the second Adam, saved us from the curse of sin and death. We have been set free! All I can say is Thank-you Jesus! I wrote an article called, "It Is Good," on this very subject, inspired by a song called, Good (Adam and Eve) sung by Matthew West and Leigh Nash. If you would like to read it and also watch the music video just click on the "Church Articles page" above. Peace on earth good will to men. We have entered the season of Advent, preparing for the day of our Savior’s birth. Trees are lit, gifts have been bought, and families gather together in celebration. Something, however, is missing. Something that we long for, pray for, hope for—Peace on earth, good will to men. Henry Wadsworth Longfellow wrote the poem “Christmas Bells” which ultimately led to the Christmas carol “I Heard the Bells on Christmas Day” while our country was in the midst of the Civil War, and he was in the midst of depression due to losing his beloved wife, Fanny as a result of an accidental fire, and his son, Charles suffering a crippling war injury. There was no peace for our country, nor for his soul. His head was bowed in despair and he was certain there was no peace on earth—For hate was strong and mocked the song. Hate and despair, however, could not silence the bells. This past year has been tumultuous for our nation. Peace has been nowhere to be found. Many have endured their own times of despair. Hate this past year has been strong and has done everything in its power to mock the song. 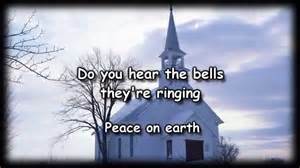 But, the bells refuse to be silenced. Can you hear them? Listen closely. The bells will continue to ring through the chaos and strife, through war and fear, through loss and despair—the Christmas bells will continue to ring. Can you hear them? Please take a moment to watch the hauntingly beautiful video of Longfellows, "Peace on Earth Good Will to Men"
The mock trial was over, He had been condemned to death, though He was innocent. His betrayer was now dead. He was scoffed at and spat upon; beaten and flogged to within an inch of His life, thirty-nine lashes. Our blackest, vilest sins had been heaped upon Him; He now was sin. For the first time in eternity He felt the pain and loneliness of the absence of His Father God. One the Sixth Hour (Noon) the sun went black. He had hung on the cross for three hours. Alone. Lonely. His mother, John and Mary stood at his feet; all others had run in fear. He grew weaker with each agonizing breath. His legs trembling, his ankles on fire with pain, His shoulders dislocated, His face barely recognizable as a man. “My God, my God, why have you forsaken me?” He cries. The sin He bore on our behalf caused God to turn His face from His Son. Jesus was alone. The Ninth Hour finally came (3pm). “Into your hands I commit my spirit,” Jesus gasped and breathed His last. His eyes closed. His head dropped. A great earthquake shook the ground. The veil was torn. “It is finished.” Our Lord and our Savior hung from his rugged cross. Dead. His mother wailed at His feet, John and Mary at her side. It had happened. Just as Jesus had said it would. It was Friday. A day of suffering and despair: a day of fear and grief; a day when the world held its breath. It had all happened as prophesied. It had happened as Jesus had foretold. But it was still Friday. Please take a minute to watch the Music video below: Carry My Cross, by Third Day. Some of the scenes are graphic, but our Savior's death was graphic. It’s that time again. Time to swap out new calendars for old. Time to sing Auld Lang Syne, and watch the glittering ball drop. It’s a time of resolutions, seldom kept, and praying for better days ahead. It’s the time to step from the old year into the new. 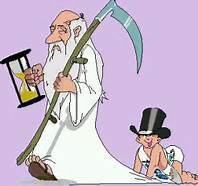 Yes, hard as it is to believe, the old year is mere hours from limping into the archives to join his predecessors, making way for the baby New Year to take over. I have to tell you, I’m not sorry to see the old year limp away: it wasn’t very kind. Yet, as I stand at this point in time, with one foot at the ready to step over the threshold into the New Year, I am able to recognize God’s hand at work. For my family and myself: as well as many of you, this has been a year of loss and grief, pain and anguish, and as recently as Christmas day…incredible fear. There were times I wondered if God honestly had a handle of things. It has also been a year of great blessings and miracles. They say hindsight is 20-20, and I have to agree. Often, it is only in looking back with this renewed sight that we are able to see God’s handiwork, His blessings, His miracles. My go to scripture is, Philip. 4:13. “I can do all things through Christ who strengthens me.” A former pastor explained that in ancient Hebrew this would have read, “I can endure all things…” We are able to endure the hardships of life, not through our human strength, but rather through and with the strength of Christ. He promised that He would be with us always, He would never leave us nor forsake us. I honestly can’t imagine enduring life without Him, without His love and strength. Can you? Yes, it’s that time of year again: time to step into a new, and uncertain year. Not one of us knows what our future holds. Oh we may have plans made, and think that we have our future mapped out, but then life happens. Surprise! Thankfully, while we may not know what this New Year may bring for us, we can know with certainty that our future rests in God’s all-powerful hands. Does He have a handle on things? Yes! ​The journey was hard, and long. The timing, he thought, could not have been worse. Though many others journeyed the same road, all heading toward one destination; his tiny group, a group of three, were far different than the others. The other travelers could not know, nor would they have believed if told, that they were indeed journeying in the presence of a King. But he knew. And still he wondered. Why he had been chosen for such a great task? His steps were slow, the path rugged, and though his master’s hand was gentle, he sensed an urgency in the man’s voice. Time was running out, this he knew. He would run if he could, but the burden upon his back was heavy, and fragile. One cautious step followed another. Each step he knew caused her pain, yet she never uttered a protest. Her voice and touch encouraged him, as one mile turned into another, one day into the next. His eyes sought those of his master from time to time, seeking confidence in their gaze. Silent conversations traveled between the two: concern, fear, encouragement, and trust. Though both were fearful that time would in fact run out, they also held onto the glimmer of faith, that all would be as planned. The two walked, side-by-side; mile upon mile, step after step, traveling toward their final destination, and God’s incredible plan. But all was not working according to plan: at least not the plan of the small group. The hour was late when the three travelers finally walked the narrow roads of the tiny town. Relief coursed through each of them. She would finally be able to rest. But relief was fleeting. Her time had in deed come, pain gripped her body, and for the first time she cried out. The night was not a “silent night” within the small stable. He watched helpless, as she cried in the agony of birth, and as his master, with shaking hands and gentle voice, brought new life into the stable—and into the world. A new light suddenly shone in the midnight sky. A star greater than any had ever witnessed, hovered high above the stable. Its beam cast a glorious glow upon the three weary travelers—and the newborn babe. A new sound was heard above the rustling of the animals. The small donkey stood slowly to his feet, and one step at a time, ever so slowly, walked to his master’s side. The cry of newborn life wafted through the stable. All the animals rose to their feet, and step by step, ever so slowly, walked to the manger to gaze upon the baby within. Each and every animal, including the donkey so young, bent their knees and bowed their heads; for they knew they were in the presence of The King. The little donkey fixed his eyes upon the tiny infant, and listened to his sweet voice. Awe and wonder filled his gentle heart, as he looked into the face of the infant King: an awe, which would continue to flow within his grateful heart all the days of his life. The little donkey smiled, as only donkeys can do, as a new sound filled the stable; a sound so faint as to be barely heard – the sound of angels singing on high. The donkey lay upon a soft bed of straw, as the swaddled King slept peacefully in the manger. The soft stirrings of stabled animals comforted his weary bones. His eyes were heavy, as he pondered all that had brought him to this place, and time. It would later be told, that the shepherds were among the first to see the newborn King, but the young donkey knew the truth. For the eyes of those who could never speak the story, the gentle animals within the stable, were the first to see the King and hear his voice. With a contented sigh, the donkey fell fast asleep. ​Please take a minute to enjoy the music Video below.